A simple slide bolt style throttle stop to lock throttle travel in the strike (ready) position. 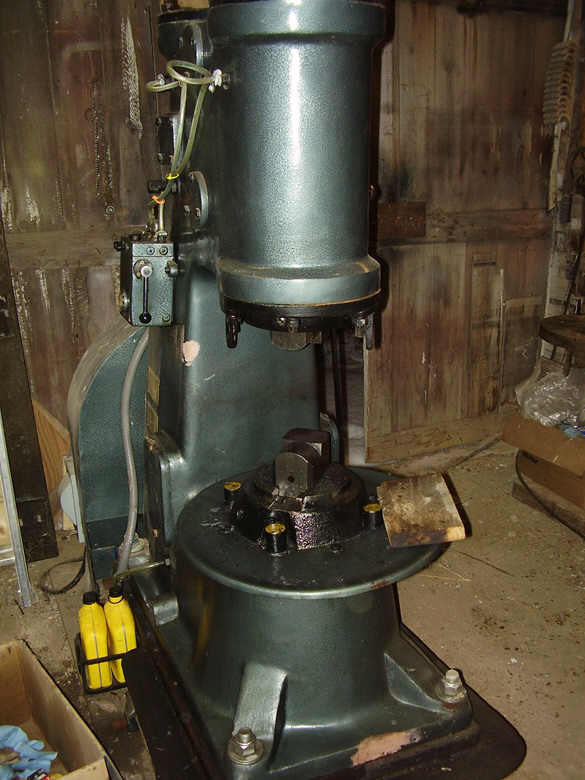 All large hammers have the raise function built into their operation. All of the smaller hammers made by Striker now have this feature also. Small hammers made by other manufacturers may still need the modification added similar to the add-on throttle stop displayed here. What is the purpose of a throttle stop? First lets describe some background surrounding the use of some American made air hammers from earlier in the 1900's including some of the expensive German made hammers still imported into the U.S. today. 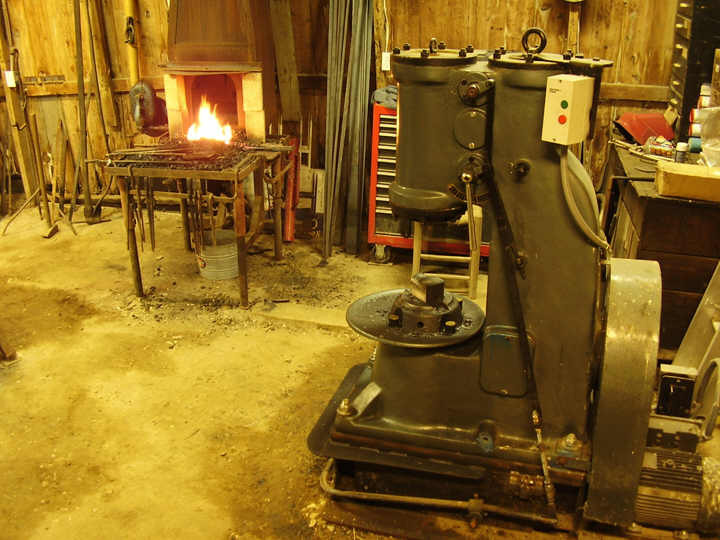 The typical self-contained air hammers operated by a single blacksmith would run with the hammer ram in the raised position. This allowed the smith to simply place the iron on the lower die and begin forging. 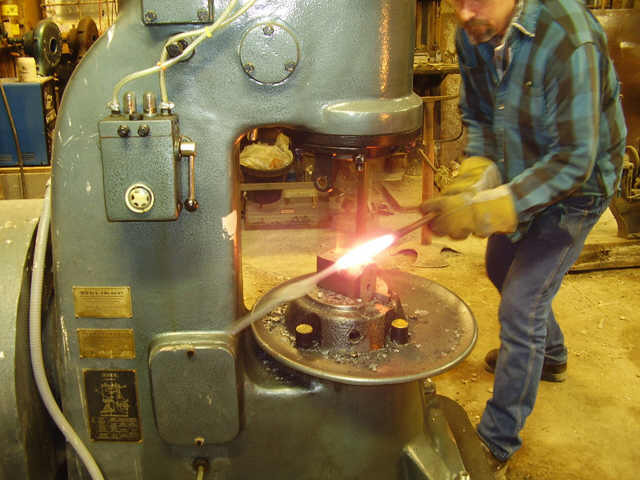 All movement of the foot actuated treadle focusing on driving the hammer ram downward to forge the iron. Now let's fast forward to some of the hammers being imported from China today (early in this new millennium). Some of the new air hammers coming from China operate with the hammer ram idle or at rest on the lower die until, the operator steps on the treadle and the ram begins to raise. The problem is that there is a very large amount of travel or movement of the treadle needed-just to raise the hammer ram and transition the throttle valve to the strike position. And only a small amount of movement or travel of the treadle to transition the throttle valve from ready to strike-to full power. This creates a very awkward situation in which the smith must first step on the pedal to raise the ram so he can then place the iron on the bottom die. But at the same time the smith must be very careful to as the treadle approaches the striking position of the treadle because of the relatively small amount of treadle (throttle) movement needed to send the ram down hard on the iron before the smith is ready. See the video below to see this action. 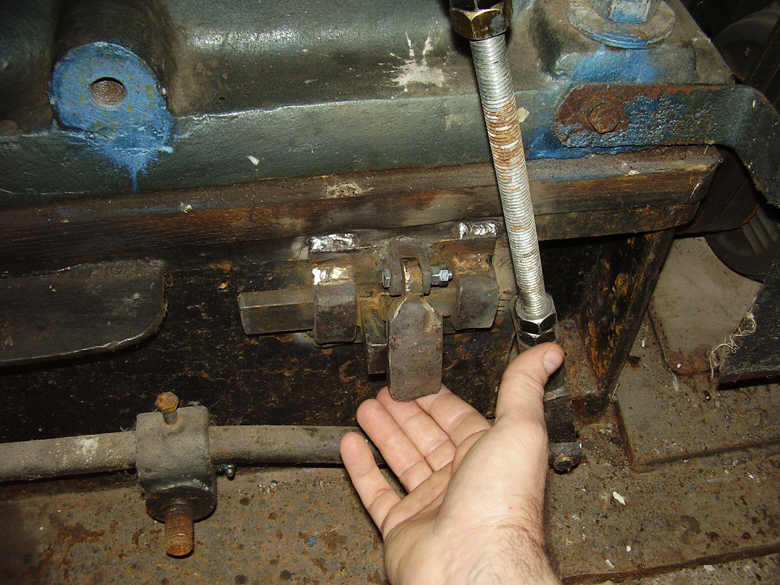 This large difference in position and amount of movement needed between "raise", and "strike" throttle conditions, is very awkward or inconvenient to manage quickly during the forging process. 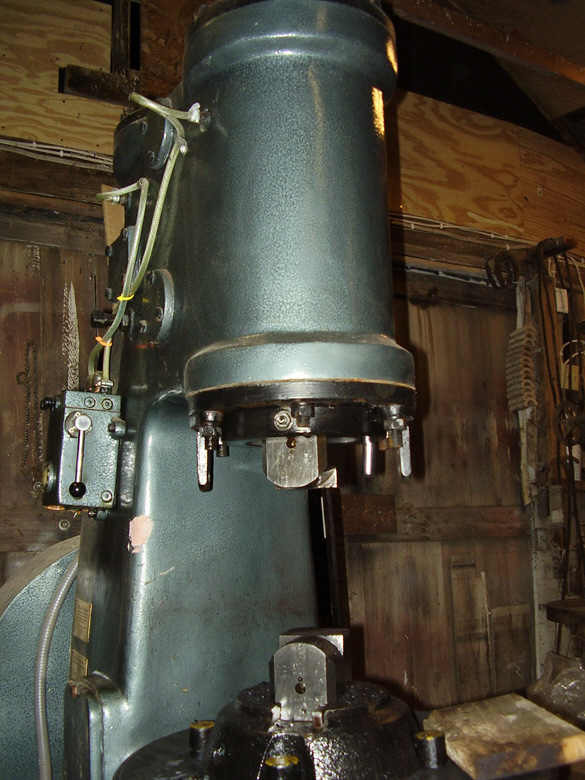 The older American made self-contained air hammers and some of the modern ones coming from Germany such as the Kuhn model hammers, employed some type of throttle designs from the factory that take care of this. But Chinese made hammers shipped without this type of throttle adjustment. Video: http://www.beautifuliron.com/Vid/STC_88_Hammer_Run.wmv This video shows how early versions of the small hammers were operated. Pay close attention to the need to move the throttle past the lift position before being able to finally move into the strike condition. 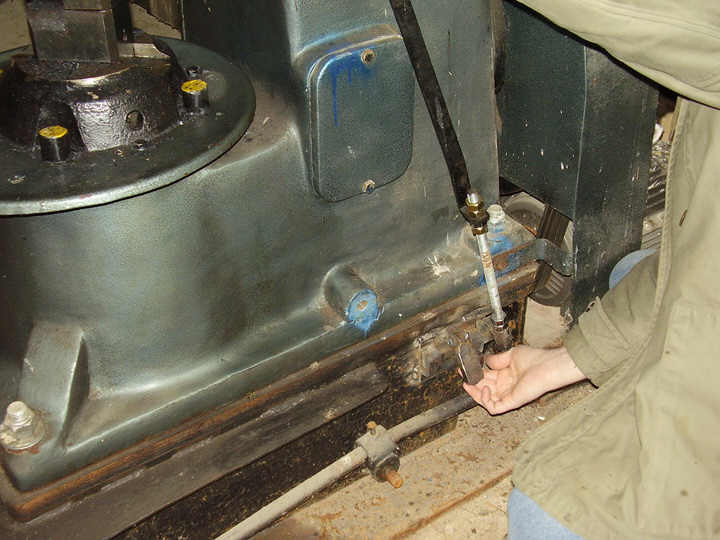 The purpose of the throttle lock was to hold the throttle in the raised position so that the hammer was ready to strike the moment the smith moves the throttle. Again, all hammers made by striker have this feature built into the hammer, and no need to make the modification on this page to a new model Striker hammer. Total video file size is 0 .4 MB and time is 23 seconds. 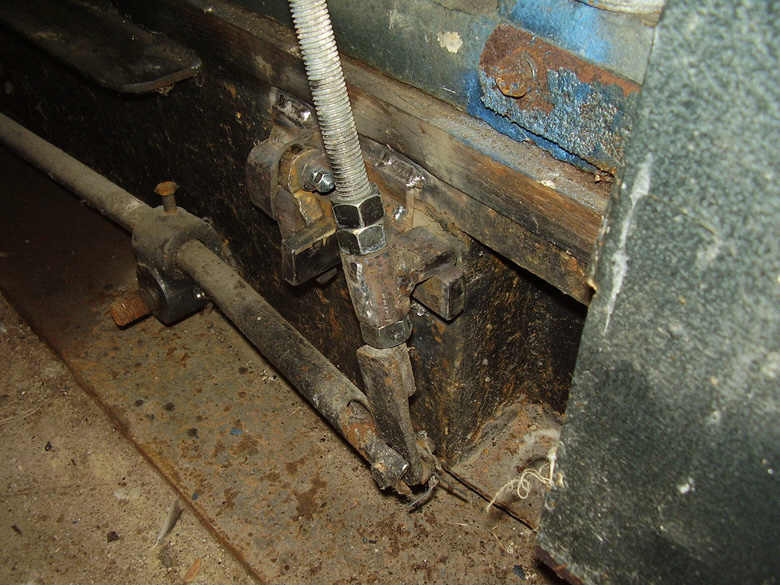 Throttle stop solution for the STC-88 air hammer. Note that this is still experimental and needs more testing and improvements. With the solution offered on this page, a throttle stop can be employed to set the hammer ram to run in a raised condition with a small reciprocating motion - the first stage of strike position. In this condition, the hammer is ready to strike. Mindful that the owners' manual warns the user not to operate the hammer with the ram raised fully up for more than 1 minute, the throttle stop design shown here is adjusted so to cause the hammer ram to oscillate up and down roughly 2 inches. Some movement is needed to supply fresh air to the upper cylinder buffer air to prevent the overheating described in the owners' manual. In the photos at right the hammer is running with the throttle stop engaged, and the ram is reciprocating up and down with the maximum lower movement roughly level with the bottoms of the shipping pin brackets (I never did remove these after uncrating my machine). 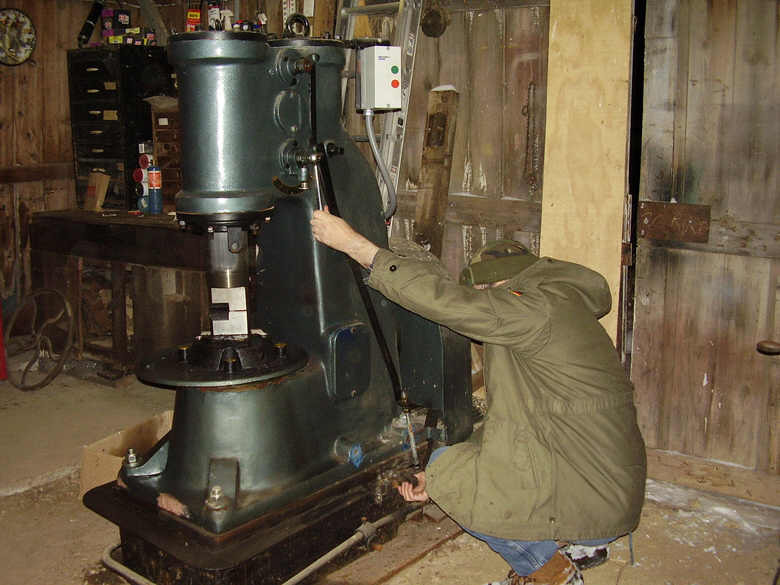 The position and reciprocating movement of the ram can be adjusted by means of loosening and tightening the nuts that secure the stop on the threaded rod, with which the height of the treadle is also adjusted on my hammer configuration. Engaging the throttle stop shown here is done by lifting the falling block up out of the way of the slide bolt handle, moving the treadle down so that the stop on the treadle is lifted above the slide bolt, shoving the slide bolt under the stop on the treadle link, and then dropping the falling block to prevent the slide bolt from moving. It can be seen in the photos here that the slide bolt is limited in total maximum travel. 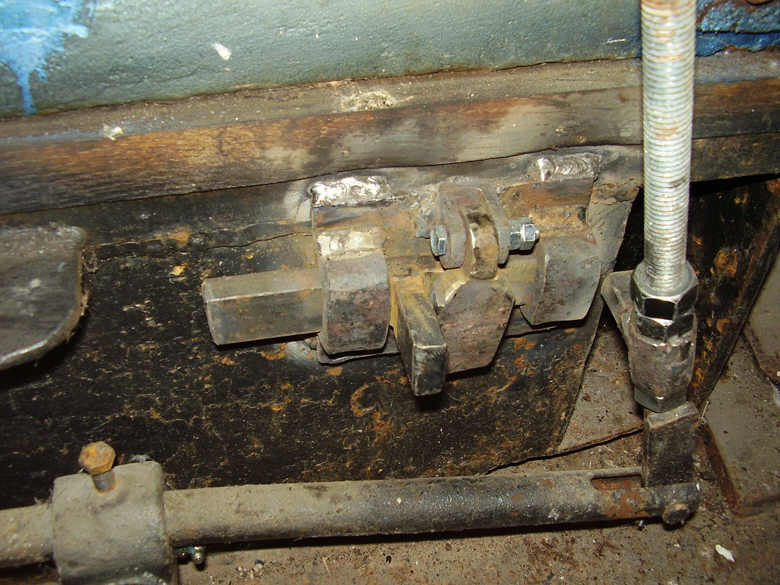 The handle of the slide bolt be moved only as far as the brackets the support it. And the falling block was made exactly wide enough to hold the slide bolt in its farthest left or right positions. There is only a small gap between the block and the slide bolt handle- just enough to allow the slide to block to work easily and not jam. Update on testing of this design. To test this throttle stop, I am using it during routine forging to be sure that it performs as expected. The projects forged required large open space between the dies for use of special tooling. When operation of this design is fully ready, I will report the findings here. 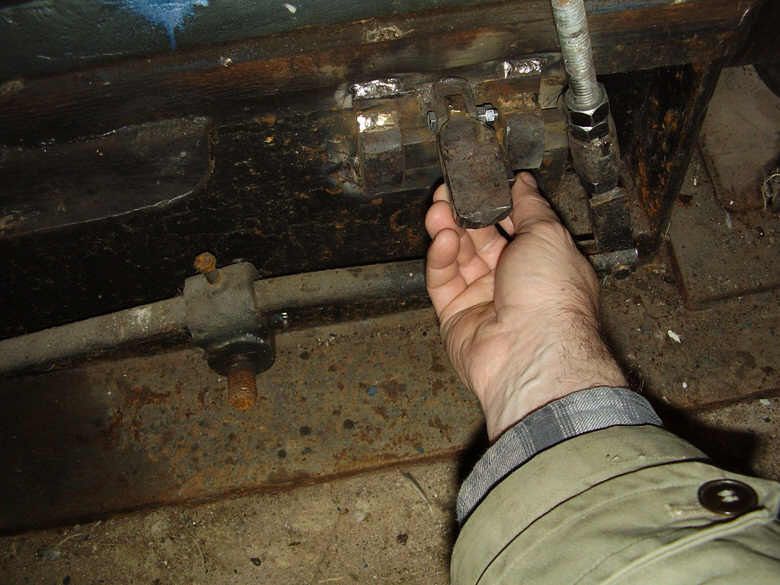 The throttle stop was installed during December 2005, and a new page has been started to show this solution. After using the throttle stop shown above to keep the hammer ready during a large number of forgings, it was found that their was still something other needed to help control the hammer. The throttle link has a lot of play that allows it to twist and wiggle around. This movement was enough to cause the throttle condition to be unpredictable, sometimes causing the hammer ram to reciprocate too far down and at other times causing the ram to stay too far up in the raised position with no movement. A solution was needed. 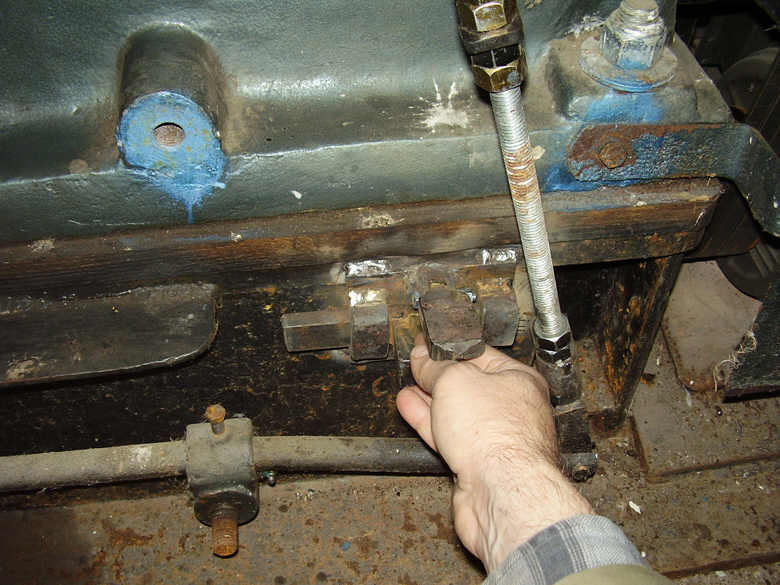 This was accomplished by modifying the connection between the lower throttle link and the back of the treadle. The clevis pin and washer and cotter pin were removed replacing them with a bolt and lock nut of the same size. The slot cut in the back of the treadle that accepts the lower end of the throttle link, is too wide and allows the throttle link to twist back and forth. I think this allows most of the play in the throttle link that causes so much unpredictability in the setting of the throttle stop. The slot cannot be squeezed together because this would give the slot a wedge shape and cause more opportunity for the throttle to twist back and forth, though not as much. A better solution seems to be inserting a washer inside this joint to hold the lower end of the throttle link firm and prevent it twisting. The lock nut then holds everything firmly together. After this latest modification, the throttle stop appears much more practical. The twisting movement that once seemed to contribute to wildly unpredictable ram motion, is no longer a problem. More time working with the new modification has yielded up some interesting observations. Still a little unpredictability with the new throttle stop. The problem is a result of a loosely fitting slide bolt in the throttle stop. When I first made the throttle stop, I was expecting the parts to tighten after welding. So accordingly I made the slots for the slide bolt a little too loose, and consequently the square edges of the slide bolt can change the overall height profile of the top edge of the slide bolt as a result of vibration during use. This poor fit allows the profile of the top edge of the bolt to lock the throttle in very slightly different amounts of travel. Sometimes too low and sometimes too high. This causes the ram to sometimes run too high in the hammer and sometimes run much too low and take too long a stroke during idle. Solution: Fit the slide bolt and the slide brackets very tightly or closely together. Don't allow room for the slide bolt to twist or wiggle. Fit the parts tightly. I must heat with a torch now and hammer the parts more tightly to remove excess play. Still the hammer is much more easily controlled than before I first started this project. Latest update August 28, 2007. Page created December 8, 2005.